“Saving” is a funny word in this context. It may not mean what you think it does. 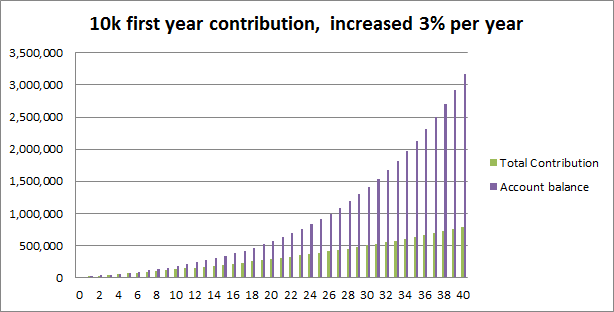 After 40 years, by investing your money, you will end up with 4 times the amount you contributed. 4 times. In other words, investing your retirement saving basically cuts the amount you need to save by 75%. Instead of saving 40k per year, now you only need to put away 10k per year. When people talk about retirement saving in modern days, often it is implied that the money is also invested. Not investing the money will make the money lose value to inflation. You want to at least keep up with inflation. The most simple form of investing money is putting the money in a savings account at a bank. I don’t know the history of interest rates with savings accounts, but in the current economy, savings accounts earn you basically nothing. Alternatively, you can purchase certificates of deposit (CD’s) from the bank. CD’s are as safe as money in a savings account, but they are untouchable for a specified period of time and thus carry higher interest rates. Past this, we get to the full-fledged, complicated world of investment. Bonds and other types of fixed income, individual stocks, mutual funds, etc. are probably terms you have seen somewhere else if not on my blog. And this is where it gets interesting. There is more risk and more returns involved here than with commercial banks’ products. But don’t freak out. There are actually very simple ways of investing your retirement savings that take very little brainpower to figure out. Most of us do not invest to make a living, and the professionals get paid to make it easier for us to save and invest for retirement. Hopefully you have realized by now that retirement saving doesn’t involve just “saving” in the most common sense. Because in the next post I will show you a type of investment account dedicated specifically to helping you save for retirement.